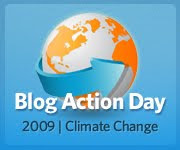 Hey kiddies, just a reminder that tomorrow is Blog Action Day. This year's focus will be on climate change. While I get my post ready, why don't you head over to my original piece on this? Happy reading! And leave a comment if you plan to blog for BAG!